(L to R) Fulton Police Chief Orlo Green, FPD Sgt. Stephen Lunn, and Fulton Mayor Ronald Woodward Sr. address concerns from a first ward neighborhood. FULTON, NY – On September 23, 2018, Cody A. Cooper, 23, of Fulton, was arrested by Fulton Police Department and charged with reckless endangerment in the first, a Class D felony, as well as criminal possession of a weapon in the fourth and menacing in the second, both Class A misdemeanors. After investigation, Cooper is accused of “intentionally firing a single round of ammunition from a 12 gauge shotgun while standing on his front porch toward several occupied dwellings and into the general direction of several pedestrians,” police records show. Fulton Mayor Ronald Woodward Sr. said the shotgun was fired after Cooper engaged in an altercation that continued to escalate with a neighbor. Several neighbors of the house in which the incident occurred, 69 W. Second St., were quick to address city officials when Cooper was released post-arrest within the same day. Police records show that Cooper was arraigned in Fulton City Court in front of Honorable Judge David Hawthorne and released on his own recognizance. From left: Fulton Police Chief Orlo Green, FPD Sgt. Stephen Lunn, and Fulton Mayor Ronald Woodward Sr. address concerns from a First Ward neighborhood. 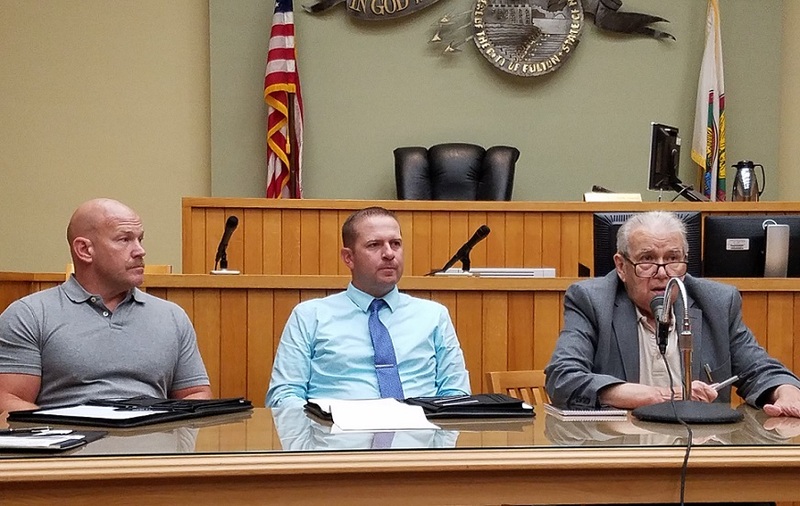 During a meeting of the First Ward with neighbors in the affected area, Mayor Woodward, Police Chief Orlo Green III, and FPD Sergeant Stephen Lunn explained the post-arrest process. Chief Green explained that Fulton Police Department may respond as the arresting agency and make the arrest, however, the presiding judge decides whether to set bail or release the defendant. 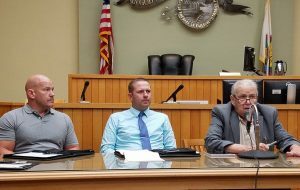 For felony charges, the decision comes after receiving bail suggestion from the Oswego County District Attorney’s office. “I understand your frustration. We’re available, we’re accessible, so you come and complain to us and we do what we can do, but we don’t run the jail and we don’t run the court,” Woodward said. Though recommendation comes from the District Attorney’s office on felony charges, the end determination is “entirely up to the judge,” Green said. Fulton Chief Court Clerk Maureen Ball said several factors are in play when determining bail. An attorney makes an argument on behalf of the defendant, referred to as council at first appearance, and then the judge will use all information provided before making a decision. “It’s really a discretionary thing based on each case. The judge will review the accusatory, the argument of the people, and the response of the defense before making a determination,” Ball said. The purpose of setting bail is not for punishment. Instead, bail is used to ensure the reappearance of a defendant. Stronger felony charges that carry heftier possible sentences leave more presumption that a defendant may flee, she explained. Mayor Woodward encouraged residents to reach out to the parties responsible with their concern for releasing defendants post-arrest and to use their responsibility to vote to make informed decisions if they are displeased. City court judge and the county’s District Attorney are elected positions. Honorable Judge Hawthorne is serving a 10-year term as the city of Fulton’s full-time judge after his election to the position in 2013. Oswego County District Attorney Greg Oakes was re-elected to his position in 2015 to a four-year term. The enforcement of laws is not an issue, Sgt. Lunn said. “You’re frustrated with the process and I think as you dive into this you’re going to realize where some of the failures are. I think some of you want us to enact more laws and if we enact all new laws tomorrow, law enforcement will absolutely enforce them, they will arrest them, but post-arrest we have no input on whatsoever,” Lunn explained. Green confirmed that the FPD may often times have no other contact with a case after taking the suspect into custody but reminded that although they are not initially remanded to jail post-arrest, they are still responsible to follow through the justice system and appear in court to answer to the charges. “We do what we do and then the court does what they do. We are entirely separate. I think people misunderstand that. The judge is an impartial party that makes decisions based on evidence, he does not answer to us at all,” Green said. Repeal 2A, drop Kavanaugh, and 44>45. Why was this person not taken to a mental health facility immediately?? He obviously posed a threat to others and maybe to himself. Were all is weapons removed from his home?? And you wonder why people leave (messed) up Fulton. metoo: That’s the part that I don’t understand. Hes telling the womens kids there are soldier hiding in trees, in the yard. Clearly he is a danger to neighborhood and a nuisance. A week after his arrest and release on these charges Cody Cooper decided to back his truck up on the lawn of the neighbor and peel out on the lawn. It left the lawn dug up, burn out marks on the curb and in the street. It is very apparent this man has extreme anger issues, is unstable and has no impulse control. He is a danger to everyone in that neighborhood. Can’t clean up the west side if judges do not support their arresting officers and the good people of a neighborhood who is just waiting for Cody’s next dangerous move while “released on his own recognizance”. Maybe this 2nd arrest for this most recent actions will send a message to the Judge that this man needs to be jailed, not out harassing the good and caring people of this neighborhood.